MarcBelisle – Honest ad-free analysis. Tuesday, November 6th is election day. Millions of Americans will head to the polls. Millions of other Americans will ignore the election and not bother voting. Both groups have the right to vote or not vote. But only those who vote will be fulfilling their civic responsibility. We could make a simple Venn diagram of things that are both rights and responsibilities, and voting would be smack in the middle of it. There are not many things that are both a right and a responsibility. Serving on a jury is a responsibility, but it’s not a right. Owning a gun is a right in America, but it’s definitely not a responsibility, even though the NRA and its cheerleaders disgustingly try to tell us it is after every mass shooting. The Second Amendment implies the right to not own a gun. The First Amendment’s freedom of religion guarantees the right to observe no religion at all. The right to vote seemingly implies a right to not vote, but not voting is ethically more similar to failing to show up for jury duty than to not going to a church or not buying a gun. The fact that voting is a right is important. The effort by Republicans to strip hundreds of thousands of American citizens of their registrations and access to polling places is an attack on their rights. But we shouldn’t think of it strictly as a right. Liberalism in America has lost sight of its emphasis on democracy’s duties, obligations, responsibilities. President John F. Kennedy called the nation to civic duty in his inaugural address with the call to “ask not what your country can do for you, ask what you can do for your country.” This may be taking it a bit far. A healthy social contract requires mutual investment between the people and their government. But his point is true: we need to think about what we can do for our country. And voting is one of the most important duties we have as citizens. Writing about the national debt, Thomas Jefferson said, “For a nation as a Society, forms a moral person, and every member of it is personally responsible for his Society.” This idea is at least as old as Plato’s “Republic,” which thinks of a good society in terms of the best way to educate an individual. Jefferson’s ideas were born in the Enlightenment. The greatest thinker of Enlightenment ethics was Immanuel Kant. Kant’s categorical imperative, sort of the golden rule for grown-ups, states that you should always act in a way that it would make sense for everyone to act. It might seem okay to run a red light once in a while when no one is looking. But if everyone always did that, the whole traffic system would collapse and people would die. Similarly, it’s easy to think that your one vote doesn’t matter. But if everyone decided not to vote, then not-voting becomes the deciding factor in an election. And something other than democracy would decide how the country is ruled. In 2016, only 55% of eligible voters participated. In 2014, only 34% voted. THIRTY-FOUR PERCENT. That’s a third of all voters. Two-thirds of Americans sat out that election. The highest turnout election in recent history was 2008, when 58% of voters showed up. That’s still 42% who didn’t bother. The last time 60% or more of voters turned up was in the 1960s. We have been lucky for a long time that there were no truly bad faith actors who exploited that void of legitimacy in our democratic system. But our luck in that regard started to run out in 2016. As a whole, America is failing to fulfill its responsibility to vote. And each individual who doesn’t vote shares his or her moral responsibility for that mass failure. Even though Republicans are doing their best to make it hard to vote, the number of people who don’t bother to vote is the biggest threat to democracy. Our media culture has conditioned us to think of our democracy as an interminable pageant of horse-race analysis. It’s easy to tune that out. And millions of Americans have. But the two-year election cycle is the wrong prism through which to view democracy. Achieving and maintaining a democracy is extremely rare. There have only been three significant expansions of democracy in world history. In the ancient world, the Greek city states invented democracy. Their run of democracy lasted under 200 years, shorter than the history of the United States. And during that time period, probably under 100,000 people lived under democracy at a given time. Meanwhile, the Greeks were warring with the decidedly undemocratic Persian empire, which had a population of around 100 million. So, even though the ancient Greeks passed down a remarkable cultural heritage to the world, it’s important to remember that it was far from a normal experience to live under democratic rule in the ancient world. In the modern world, the Enlightenment sparked a series of revolutions that began with the bloody birth of America in 1776 and continued for nearly a century as monarchies crumbled around the world. In the 20th Century, democracy contracted with the rise of communist and fascist dictatorships. After World War II, some liberated peoples were restored to democracy, while others languished under the Soviet Union or new forms of military junta for the next half century. The fall of the Soviet Union was the last great expansion of democracy, which saw the former Soviet satellites rush toward integration with the West. And it is only in the past few decades that a majority of people in the world have lived under something resembling democratic rule. In the 60,000 years or so since homo sapiens began leaving Africa and building complex settlements, there has probably been less than 500 years during which there was a broadly organized, highly functioning democracy somewhere on earth. And even during those times, the vast majority of people didn’t live in a democracy. In the grand sweep of history, most societies have been organized around clans or tribes. Most social contracts have been openly hierarchical and unjust. Most political paradigms were of warring states and rising and falling empires. Most human beings who have ever lived were lucky if they lived in a time of relative stability, wherein a warlord provided protection in return for menial labor and unquestioning loyalty. Hundreds of millions of people even in the 20th Century died grisly deaths because they were even less lucky than that. That our democracy exists at all and that we happen to live in it makes us among the most profoundly fortunate people who have ever lived. Democracy is now under siege around the word. Countries as disparate as Venezuela, Turkey, Hungary, Poland, Brazil, the United States, are experiencing an insurgence of oligarchy and strongman demagoguery chipping away at the foundations and safeguards of democratic society. It used to be an article of faith that democracy would eventually and inevitably inspire one-party states like Russia and China to open up as more of their people experienced globalism. Recent events have actually shown the opposite. Authoritarian states are closing down more, and serve as inspiration for anti-globalist, anti-democratic, anti-immigrant parties in longstanding democracies. Democracy is something that can never be taken for granted. And yet, when we fail to vote, that is exactly what we are doing. It is my fervent hope that recent elections, and the right wing erosion of the right to vote, has taught the American people that we are never more than one election away from potentially losing our right to vote forever. When we don’t vote, people who don’t want us to vote get into power. Once anti-democratic forces gain power, even in a democracy, history shows us it can be very hard to get them out. In America, we are straddling the razor’s edge of grand historical change. We will either pull back our democracy from the brink of authoritarianism, or our apathy will allow anti-democratic forces to slice us into pieces and slide American society into the garbage disposal of history. America is profoundly lucky that we have had a deeply flawed yet very real democratic social contract for 242 years. You would be very hard-pressed to find another run of democracy that long anywhere else at any time in human history. Since the Constitution was ratified in 1788 every election has featured input from some part of the population, and some form of peaceful transfer of power (yes, you can find exceptions, but they prove the rule). Throughout human history, most transfers of power in non-democratic societies are bloody and terrifying, and are ultimately decided by a small cabal of the powerful for their own private interests. Every single election is a passing of the torch, not to some abstract unknowable future, but only until the very next election. Failing to vote is dropping the torch that has been handed off since the American Revolution. Failing to vote is saying that you don’t need to have the right to give your input in how society is run. Failing to vote is saying that you’re okay with a bloody power struggle. Failing to vote is saying that it’s okay if a small cabal of those who monopolize military, financial and media power decide who rules and how. Failing to vote is saying that it’s okay if you and everyone who comes after you lives in a dictatorship. Despite the wreckage of the 2016 election, there is still a lit, but sputtering torch being passed to you. You have not only a right, but a responsibility to pick up that torch on Tuesday, and pass it on until the 2020 election. If you don’t hand it off, it might not be there at all next time. And then the flames coming for you won’t be a torch. No matter how hard it is to vote on Tuesday, no matter how long the line is, no matter what ID they ask you for, do whatever you have to in order to vote. If they try to deny you, ask for a provisional ballot. They cannot legally refuse you a provisional ballot. If anyone does anything to attempt to deny you your right to vote, including unreasonably long lines, contact the ACLU. It’s no accident that our national anthem ends on a question. Every election we have to decide whether our flag still waves over the land of the free, or if it waves over something else. No generation of Americans since the Civil War have been faced with that question in a more fundamental way than we are. On Tuesday, please fulfill your responsibility, and answer that question with a resounding yes. The disappearance and likely torture-murder of Jamal Khashoggi is Trump’s biggest international crisis since engaging in brinkmanship with North Korea, and he has made a huge mess of it. By backing Saudi Arabia’s ludicrous evolving explanations for how an American permanent resident and Washington Post journalist walked into the Saudi consulate in Istanbul and vanished, Trump aggressively undermines journalists all over the world and America’s claim to leadership in the free world. Related Story: What Did Trump Admin Know about Saudi Killing of Journalist and When Did They Know it? Trump has obvious conflicts of interest in this case. Trump’s ties to Saudi royalty go back decades, as Business Insider reports. In 1991, he sold a $20 million yacht to a Saudi prince. In 2001, Trump rented out an entire floor of Trump tower to the Saudi royal court. More recently, the Saudis have spent a fortune at his hotels since he became president. It is believed that the Saudis spent a great deal on his inauguration. After announcing his candidacy, Trump set up several shell companies in Saudi Arabia. It’s worth noting that Trump’s ongoing violations of the Constitution’s emoluments clause are more than a technicality. They got a man killed. Saudi Crown Prince “MBS” for Mohammed bin Salman (or Mr. Bone Saw?) would not have been so brazen as to whack an American journalist if he didn’t believe he had the White House in his pocket. On an immediate level we can thank Trump’s blatant corruption for this problem. But on a deeper level, Trump is preserving the status quo. Official Washington has embraced the House of Saud since World War II as a key element of its international security architecture. The Saudis keep crude oil flowing and the United States sends cutting edge weapons systems to the Kingdom. According to data compiled by the Pentagon, Saudi Arabia has spent almost $90 billion on US defense contracts since 1950, the largest purchaser in the world by a large margin. The US imports nearly 10 million barrels of Saudi crude per day, comprising about 10% of the Kingdom’s total export volume. This arrangement keeps the balance of power in the Middle East, and especially balances against Iran. The most obvious example of this is how Mr. Bone Saw gave women the “right to drive” then imprisoned the top activists of the women’s rights movements in the Kingdom. In retrospect, this whole thing was an obvious PR operation for Western consumption. With one hand, Mr. Bone Saw gave Washington cover to publicly back his regime because it’s “reforming.” With the other hand, he strangled the people he had allegedly liberated. Congress had to have been aware of this, and they were fine with it as long as it looked kosher from a distance. Jamal Khashoggi had the audacity to speak the truth about this situation. And Mr. Bone Saw reacted as a thuggish mafia don by allegedly having the man sawed to pieces. The Saudi Prince didn’t do himself any favors, though. Khashoggi’s message has become far more powerful through his death than it was while he was alive. So, the argument for selling weapons to Saudi Arabia is that they are a deterrent to Iran. The theocracy in Tehran is ascendant in the region and needs to be contained, the thinking goes. But nothing gave Iran more power in the region than George W. Bush’s decision to flick Saddam Hussein off the board. Tehran flooded the resulting power vacuum. Baghdad is now a virtual satrap of a new Persian empire. Barack Obama and Europe confronted this reality and struck a deal to live with Iran by putting a lid on its nuclear program. Trump then tore up America’s involvement in the Iran nuclear deal. So, the fact is, no country has destabilized the Middle East and given Iran room to expand more than the United States. Do we really know what we’re doing there? But the more horrifying fact is that the weapons we sell to Saudi Arabia are not being used as a “deterrent” at all. Saudi Arabia is committing genocide in neighboring Yemen, a weak and poor country incapable of defending itself from the Kingdom wielding American weapons. The indiscriminate bombing has massacred tens of thousands of civilians. It has created a dire situation of widespread plague and famine that threatens millions of lives. The US is complicit in these war crimes. In August, Saudi forces launched a guided bomb that shredded a school bus bumping along a dusty road in Yemen. The blast slaughtered dozens of children. Lockheed Martin produced the bomb, which means that American workers assembled it at a plant in California, Texas, or Georgia. And the Pentagon approved its sale to Saudi Arabia. Such incidents have been happening regularly in Yemen for years. Since the end of World War II, the US has championed the international system that granted America global hegemony, helped it win the Cold War, and ushered in the “unipolar moment.” The three key pillars of this system are (1) oil production in the Middle East, (2) global finance in North America and the democracies protected by America in Europe and Asia, and (3) weapons sales to allies from the bloodiest tinpot dictator to the most bourgeois social democracy. This routine has been so ingrained for the past 70 years that the oil, finance and weapons industries arguably run the American government more than the government regulates them. But America is long overdue for a grand rethinking of its strategic posture in the world. In the next few decades, the American-led tripartite oil/weapons/finance system IS DEFINITELY GOING TO DIE. How do I know that for certain?, you may ask. The UN Intergovernmental Panel on Climate Change released an alarming report on October 8th. It concluded that the world has warmed by 1°C (1.8°F) since the beginning of the industrial revolution. This change is caused primarily by human societies pumping carbon waste into the atmosphere. The report warns that the world has only 12 years remaining to act to reduce global carbon consumption in order to prevent the planet from warming more than 1.5°C (2.7°F). In order to do this, the human species would have to reduce its carbon consumption by 45% by 2030. If we fail to, the earth will likely warm by 2°C (3.6°F). The difference in outcomes from half a degree is enormous. At 1.5°C, climate change will be bad, but manageable. If we allow the earth to warm by 2°C, it will begin to spiral out of control. Try to imagine what the world will look like starting in the middle of this century if we fail to arrest this process. Coastal cities around the world will be flooded. Agriculture will collapse, fisheries will die off. Regular extreme heat waves will roast tens of millions of people, causing thousands of deaths per year. Desert and tropical areas will become uninhabitable and semi-arid regions will become deserts. Drought will be near-constant in some areas. Other areas will be ravaged by super storms and floods. The earth will be aflame with massive wildfires every year. Countries will go to war over water access. Some rebellions will overthrow governments and others will be brutally crushed. Famine and disease will run rampant. All told, there will be more human beings fleeing some cataclysm than at any time in history. Humans have been burning carbon into the atmosphere for about a quarter of a millennium. In that time, the earth has warmed by one degree Celsius. So it may seem like we have time to figure this out. But, in fact, half of all the carbon dioxide that humanity has ever burned was consumed in the last 25 years. Americans consume the most per capita, followed by Europeans. The industrial growth in China and India is also contributing to this sudden output. Just 100 companies account for over 70% of all carbon exhaust. These companies are fossil fuels giants like Exxon Mobil, Saudi Aramco and Russia’s Gazprom. The UNHCR estimates that there are currently 68.5 million refugees in the world today. That’s the highest number since the aftermath of World War II. And that uptick of refugees has caused normal political paradigms to go haywire across the globe, ushering in a generation of demagogues onto the world stage. But if we allow the globe to warm, we’re not going to get more wise, rational and stable when there are hundreds of millions of refugees around the world. We will go mad. Governments will collapse in a heap of rubble in a shockwave felt across the planet in only a few decades. So, for the past 70 years, selling weapons to Saudi Arabia and buying its oil has been a linchpin of America’s national security. But soon it won’t be, because one of two things is going to happen. Either, we are going to dramatically decrease how much oil we consume and transition to clean energy economy. Or we are going to continue consuming oil at an accelerating rate, and there will be so many refugees on the move in the world that human civilization will begin to collapse. Those are our choices. There is no way around this choice. Any definition of American national security that ignores these facts is dangerously shortsighted. So, I propose this. We begin planning for a post-oil future. The US should begin divesting from fossil fuels and investing in alternative energy innovation on a scale at least as great as its World War II mobilization. This would accomplish several things at once. It would create good jobs in the United States. It would reduce America’s carbon footprint. It would show the world that America can be a leader of ideas and innovation again. The US should then use the clean energy technology it develops and sell it to foreign countries the way it currently sells weapons. In a world rapidly warming, clean energy contracts should soon be a way to lock in trade deals and develop alliances. I realize that this is not going to happen with our current government. But that’s why we need everyone to vote in every election from now on. The survival of our democracy, our planet, and human civilization all depend on it. The murder of Jamal Khashoggi is a warning to the world. The rulers in Riyadh and Washington are both engaging in brutal and corrupt tactics to buttress the system that America has relied on for 70 years. But that system needs to die. If it doesn’t, Khashoggi’s untimely death will be only one of hundreds of millions before the end of this century. What Did Trump Admin Know about Saudi Killing of Journalist and When Did They Know it? Saudi Arabia lured Washington Post journalist Jamal Khashoggi to the Saudi consulate in Istanbul and murdered him, according to Turkish intelligence. Turkey claims to have video and audio evidence of Khashoggi being abducted, tortured, murdered, and dismembered with a bone saw, by Saudi hitmen. Turkish officials also told US officials that the order for the operation came from Saudi royal court, according to the New York Times. Saudi Arabia denies this, but can’t account for the whereabouts of Khashoggi, who hasn’t been seen since he entered the consulate on October 2nd. Khashoggi was a Saudi national, but lived in Virginia, where he wrote a column bluntly criticizing Middle Eastern politics in the Washington Post. He was a US green card holder, or permanent resident, and a journalist for a top American publication. Yet, Donald Trump is treating the murder/disappearance as if it doesn’t concern the White House. When confronted about it, he responded that he wouldn’t let it disrupt the plan to sell $110 billion in weapons to Riyadh. Indeed, Saudi envoys have emerged as the biggest spenders at Trump hotels since he became president and presented his hotels as an unconstitutional wallet for international bribes. But the fact that this is a conflict of interest is only scraping the surface. The connection to the White House goes a lot deeper. Khashoggi first became persona non grata in Saudi Arabia in 2016. His sin that was intolerable to the Saudi monarchy? Did he call the Crown Prince a fuzzy goofball? Did he say women have an inalienable right to drive? No. He criticized Donald Trump. That was the beginning of Saudi Arabia’s persecution of their own national working as a journalist in the US. According to The Independent, in December, 2016, Khashoggi described Trump’s Middle East policy as “contradictory,” saying that the president-elect opposed Iran but supported policies in Syria that would ultimately bolster Iran. He said that any hope of an improved relationship was wishful thinking. And for that, the Saudi monarchy banned him and his work from the kingdom. Given that Kushner helped bin Salman facilitate a purge, and that Khashoggi’s initial “crime” was criticizing Trump, it raises the question: what did Kushner know about the Saudi plan to kill Khashoggi? According to Navy intelligence analyst, counterterrorism expert, and author Malcolm Nance, US intelligence would have issued a presidential flash briefing on the threat to Khashoggi’s life within 5 minutes of it being collected. The Turks knew and they shared it with the US. This means that someone in the White House knew that the Saudis were planning to kill Khashoggi. According to 11-year CIA veteran Ned Price–who published a Washington Post op-ed explaining why he was resigning the CIA rather than working under Trump–US intelligence has an obligation to inform someone if they might be a potential target of a foreign operation, before they go overseas. The Saudi prince was known to purge opponents with the help of Kushner. Khashoggi’s persecution began when he criticized Trump. Someone in the White House knew that Khashoggi was threatened by the Saudis and failed to warn him. In this light, Trump’s insistence that it happened in Turkey and Khashoggi wasn’t even a US citizen seems highly suspect. But Trump’s messaging apparatus has gone a lot further than simply distancing the White House from the situation. Donald Trump Jr. often handles his dad’s dirty work, and churns out the real paranoid propaganda that he tweets out to the president’s base, while the man in the Oval Office gaslights the rest of the country. On Friday, Trump Jr. retweeted Federalist co-founder Sean Davis’s claim that Khashoggi was an Islamist, implying that he deserved what he got. His evidence that he was an Islamist is that, in the 1980s, Khashoggi embedded as a journalist with Osama bin Laden in Afghanistan. What they failed to mention was that the Reagan administration was funding the mujahideen and comparing them to the Founding Fathers. It wasn’t considered strange at the time, and there’s no evidence that al Qaeda’s views rubbed off on Khashoggi. Did she know something ugly was coming and wanted to get out of the way? And was she trying to tell us something about what Kushner knows? 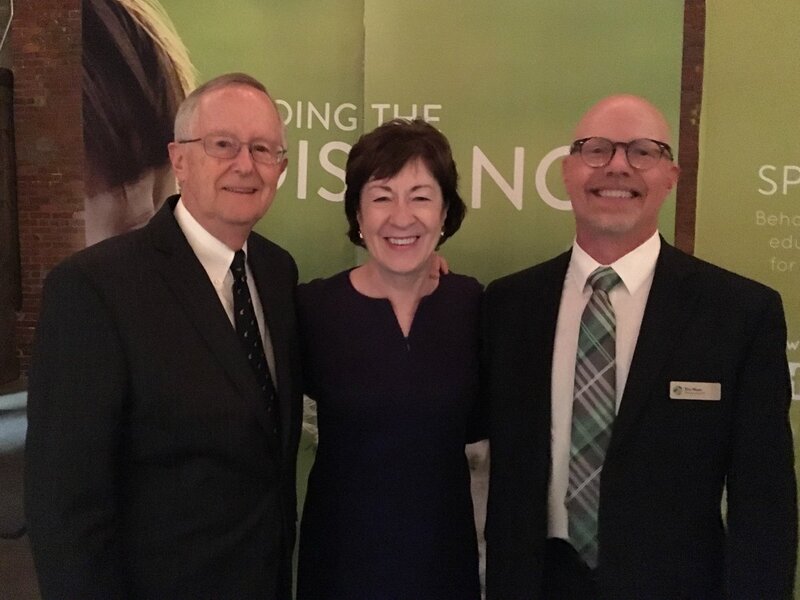 Why Did Susan Collins’s Husband Set Up Pro Bono Lobbying in Such a Remote Place? Donald Trump is awfully fond of calling things a “hoax.” From labeling climate change a “hoax” concocted by the Chinese to telling reporters that Dr. Christine Blasey Ford’s wrenching testimony was a Democratic “hoax,” all sans evidence, nothing that happens is real unless el Presidente says so, capisce? But if a hoax was perpetrated at all in the past few weeks, it was likely the performance of Trump’s fellow Republican Susan Collins, Senator from Maine. She wasted the whole country’s precious time pretending to seriously consider Dr. Ford’s testimony and weigh the merits of Brett Kavanaugh’s nomination to the Supreme Court. She did this seemingly to gin up accolades in the media about her supposed centrist bona fides. She was likely also accruing various forms of kickbacks from her colleagues, as she realized that her vote had become the linchpin to whether or not Kavanaugh was seated, and she exploited it for everything it was worth. Collins is one of the more centrist Senators, in terms of how the Senate lines up with or against Trump’s policies. Collins votes with the president’s policy preference 80% of the time, which is one of the lowest numbers among Republican Senators. But her opposition consisted mostly of protecting the Affordable Care Act and abortion rights. She was also among those who opposed Scott Pruitt and Betsy DeVos. Otherwise, she talks a big game, but when the final tally is counted, she clicks her heels and salutes. That is the opposite of what Kavanaugh will do on the Court and Collins knows that. As I demonstrated last week in my analysis of Lindsey Graham’s motivations for becoming a rabid Kavanaugh defender and Trump mouthpiece, it seems that those Republicans with Russia connections were the most determined to make sure Kavanaugh gets on the court, likely in the hope that he will act as the judicial getaway driver once Robert Mueller’s report drops. Old Believers and New Believers? Apart from loyalty to Bush, was there another reason that Collins was already locked in to supporting Kavanaugh? Is Collins linked into Russian influence? Her donor profile shows that she’s quite cozy with General Dynamics, Lockheed Martin, and financial firms. One of those includes Elliott Management, which has a Cayman Islands operation, which puts her downstream from the global money laundering apparatus. But there’s no blatant Russia link like Graham has. Let’s look at her husband, Thomas Daffron. Daffron was Senator Fred Thompson’s chief of staff from 1994 to 1998. Prior to becoming a Senator, Thompson had been a lobbyist with Arent, Fox, Kintner, Plotkin & Kah. According to a 2007 report by the Sunlight Foundation, Thompson was lobbying on behalf of Haiti in the early 1990s despite not having properly filed paperwork under the Foreign Agents Registration Act. Americans lobbying on behalf of foreign governments without proper FARA registration has been a big part of the Trump-Russia criminal saga. Remember, Mike Flynn, who was patient zero of the FBI’s collusion probe, first got into hot water for failing to register as a lobbyist on behalf of the Turkish government. What did Daffron learn from Thompson? Shortly after Daffron took the helm of Jefferson Consulting, the lobbying group did lobbying work for the town of Kenai, Alaska. I looked through lobbying records and saw a lot of typical work for typical business clients. But this stood out. Daffron had previously done lobbying work for Native American tribes (likely in relation to casino and gaming issues) while he was the executive vice president at Chesapeake Enterprises from 2001 to 2004. But Kenai, Alaska was, as of 2009, the only instance of Daffron or the lobbying group he worked for, lobbying on behalf of an individual town. When you look at Kenai’s lobbying portfolio, the town’s retaining Jefferson Consulting in 2009 is the only instance of it ever retaining a lobbyist. And the work was done pro bono. This is especially weird because Jefferson Consulting strictly handles federal lobbying. Why would a town of 7,000 people that isn’t a sovereign Native tribe, need to lobby the federal government, as opposed to the state government? Why did a powerful lobbying group under the direction of Daffron work on behalf of a small town on a peninsula in a remote area of Alaska–for free? On the surface, there isn’t much special about Kenai. The area is famous for salmon-fishing. Employers in the area currently hiring include UPS, Home Depot, a movie theater. Hardly the type of economy that retains powerful lobbyists. However, there is one thing that is–unique–about Kenai. The first European settlement at the site was named Fort Nikolaevskaia. It was established by Russian fur traders in 1786. In 1895, the Holy Assumption of the Virgin Mary Russian Orthodox Church was built, and it’s still there today, with its Russian-style onion dome. Today, the fort is gone, and the town of Kenai sits atop the site of where it once stood, surrounding the Russian Orthodox church. But even more remote than the town, at the tip of the Kenai Peninsula, is a small settlement called Nikolaevskaia, and it is populated almost entirely by a community of “Old Believers,” members of a sect of Russians who fled Russia in 1666 to escape religious persecution when the Russian state sought to reform the Russian Orthodox Church. The people who live in the settlement are devout puritans of pre-reformed Russian Orthodox. Now, I don’t want to point fingers at this settlement of fewer than 400 mostly simple people who happen to be the descendants of Russian refugees. The community is very estranged from Russia. However, if you were going to send a discreet message or launder money internationally, you could do worse than a town in a super-remote area where the population speaks Russian, a Russian operative could easily blend in and communicate under the radar of US intelligence. A town where there’s a barely-patrolled port and where Russian-speaking Americans on fishing boats practically bump into Russian fishing boats in mutually fished waters would be an easy place to move someone or something internationally. After all, there had to have been some sort of cost. A high-powered DC lobbying firm doesn’t actually do lobbying for free. So what was the payment? And why did Susan Collins marry the man she’d known most of her life in 2012, the year when Trump first attempted to run for president? There are more questions here than answers. But one thing is certain. When you start digging into the personal network of a Republican power-broker, you invariably find a first-degree link to the global money-laundering apparatus. And Russian influence is usually somewhere in the background of the network. Special thanks to Eric Garland for suggesting this line of inquiry. Follow Marc Belisle on Facebook and Twitter.